What would be a trip to a new destination without celebrating the glorious finale of a day full of new impressions and discoveries? When the sun is about to set and we start to feel our tired legs, we long for some relaxation time, not only to rest ourselves but also to reflect about the things we’ve seen and the people we’ve met. Sunset time is the perfect time to combine these two things: relax and revive the highlights of the day. 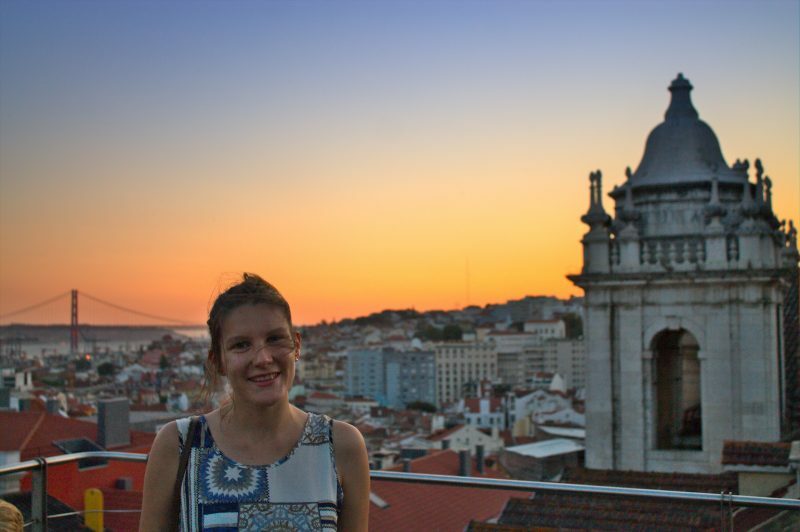 While our time in Lisbon we experienced many sunsets from many different viewpoints. 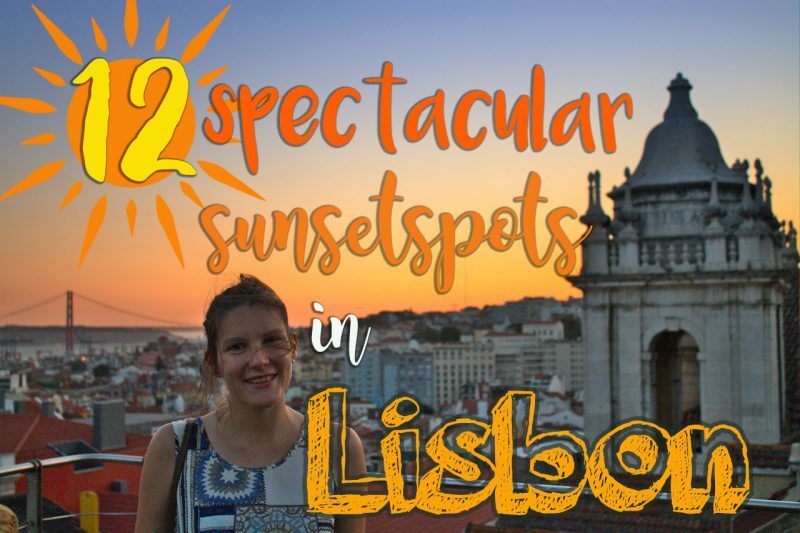 Here you find the complete list of classic as well as off the beaten path sunset viewpoints in Lisbon. 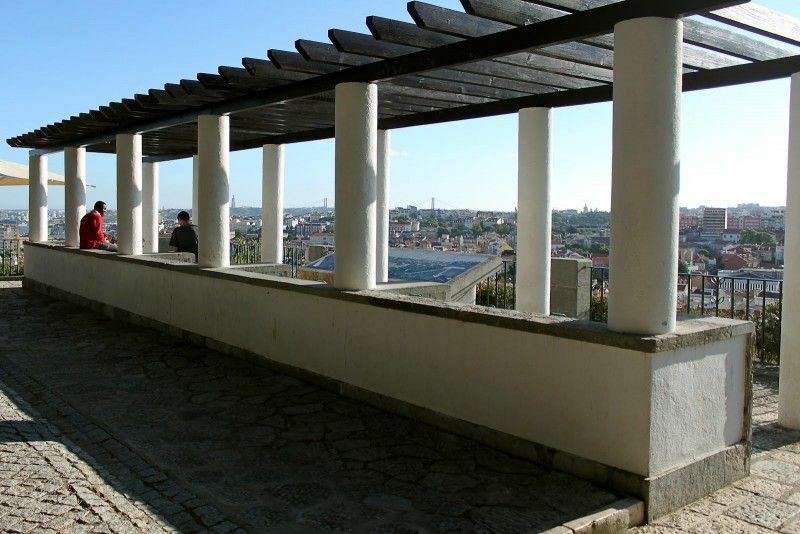 This viewpoint is the favorite in every list, offering the best view of Ponte de 25 Abril. There is no chance to find a time of day when this spot is quiet as it is the tourist’s number 1 viewpoint. When the sun goes down behind the bridge, the warm colors are reflected in the river, creating an impressive panorama which goes perfectly along a cold beer. 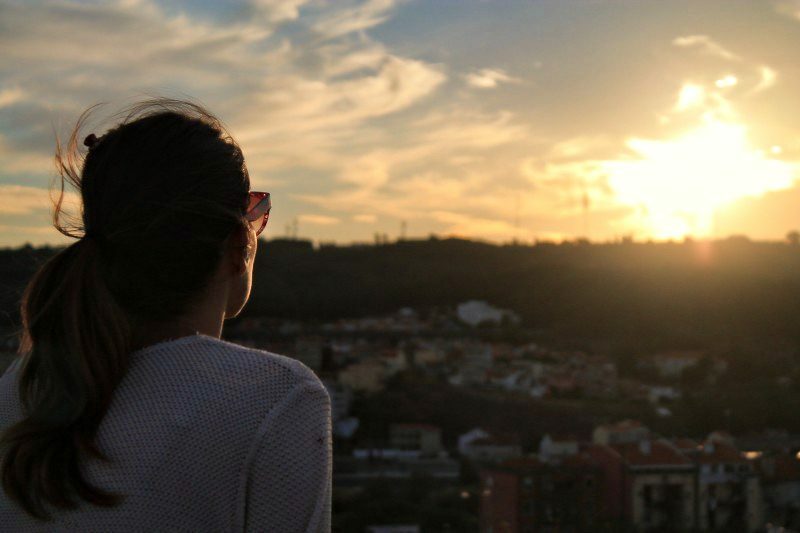 This miradouro is a classic spot for romantic sunset moments. Bring your dear and give him/her a long kiss on the mosaic balcony. This enchanting place looks like a Greek temple covered with tile benches and pergola flowers. 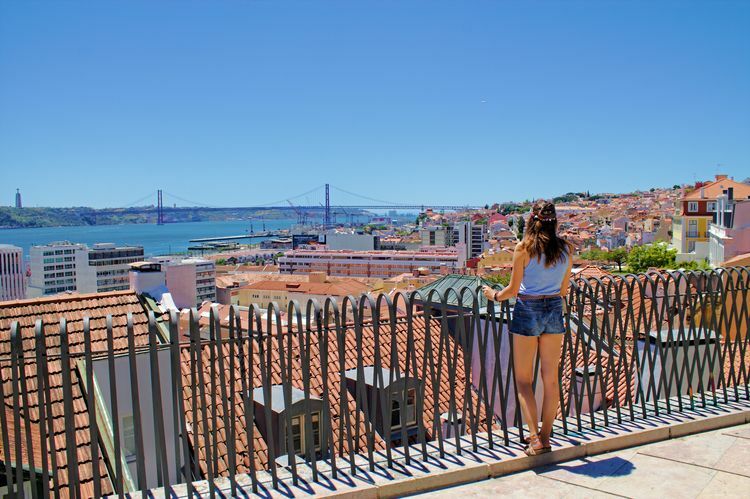 For the lazy ones who don’t want to climb up one of Lisbon’s hills to catch the sunset, mingle up with the people standing or sitting at the river promenade not far from Praça do Comércio. Make yourself comfortable on the boulders and watch how the golden light of the setting sun immerses the river. The rooftop bar, called “Park” is situated on the roof of a car park close to Miradouro de Santa Catarina. It’s a fancy place with wooden chairs and lots of plants. If you don’t want to spend money and just enjoy the sunset, nobody will kick you out. However, if you sneak in with drinks, be careful not to get caught. 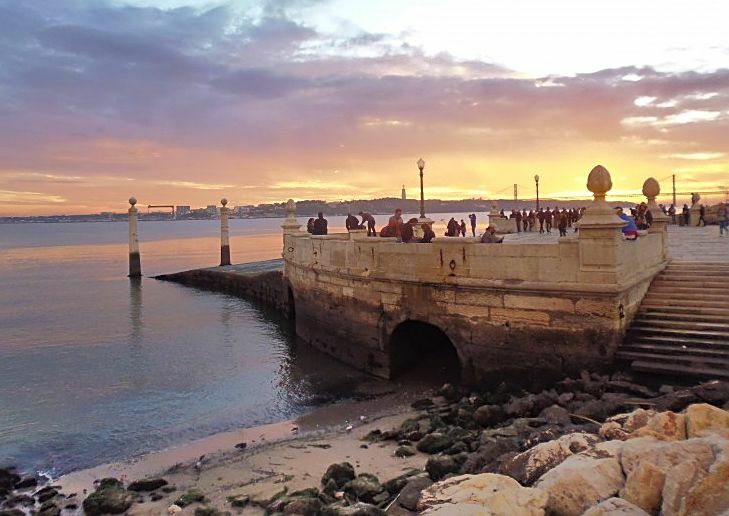 Walk along the Tagus promenade from Oceanario to the Myriad Hotel. Follow the spectacle how the sun goes down on the other side of the city sharpening the skyline. 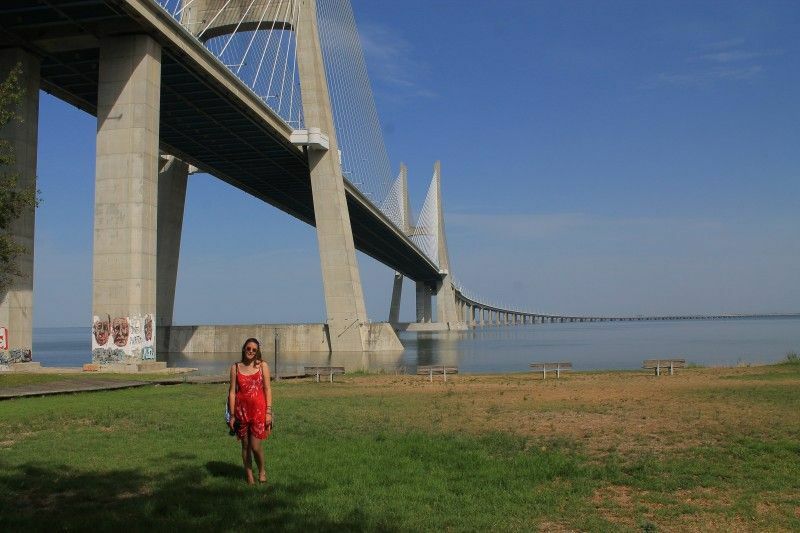 By walking on the Paseio de Tejo you can catch a great view of the Ponte Vasco da Gama. Go to Parque das Nações to rest after the walk. 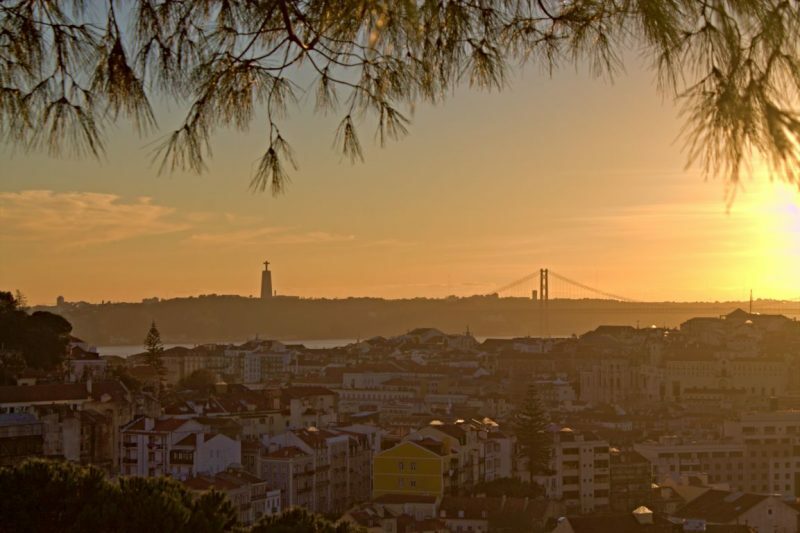 Another golden sunset view can be taken from Miradouro da Senhora do Monte. As it is located higher than Miradouro de Santa Catarina, you’ll be rewarded with an even broader view over the city. This lookout point belongs to the list of classic viewpoints and is thus often crowded. Make use of the hanging branches while taking a photo, creating a wonderful frame. This noble hotel is located in Martim Moniz. Guarded by bouncers in front of the hotel’s entrance one could get the impression that there is less chance to access. However, no need to worry as the bouncers don’t even notice you when you pass by. Just take the elevator to the highest floor and enjoy a splendid sunset behind the castle walls. Apart from all the classic miradouros mentioned in every Lisbon Guide, there are some of them that are still quite hidden. Miradouro do Monte Agudo is the best example. Built on an overgrown hill situated in Anjos, this viewpoint is still undiscovered by the majority of travellers. The long stairway can be some work, but the amazing view especially for sunset is worth every taken step. 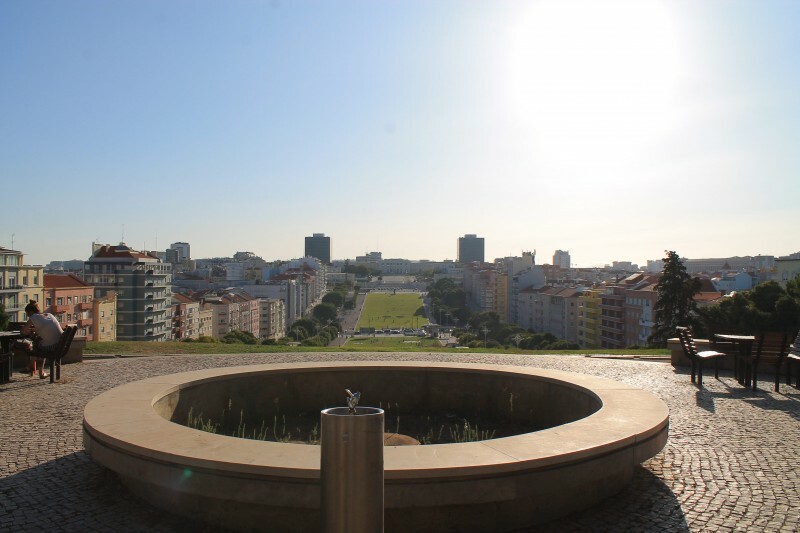 Another darling is the highest point of Parque Eduardo VII. Amongst guides it is the most famous spot to enjoy the sunset. Indeed, this place was designed on purpose to praise the sun. 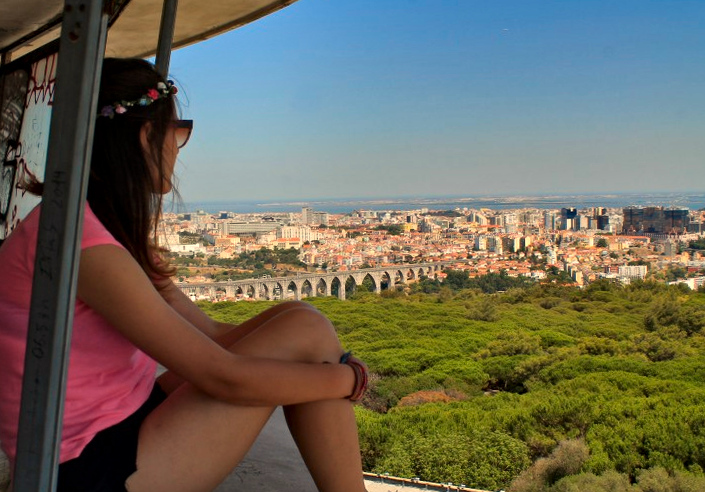 It seems as if you’re out of Lisbon looking down on the city from far away. 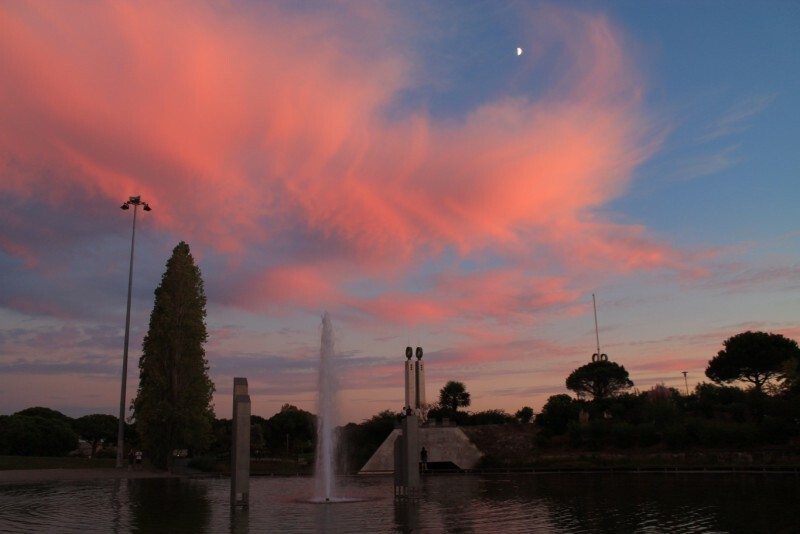 Alameda is definitely an off the beaten path location, although it offers one of the most spacious places within the city. On top of the impressive fountain Fonte Luminosa there is a balcony overlooking the Alameda square. 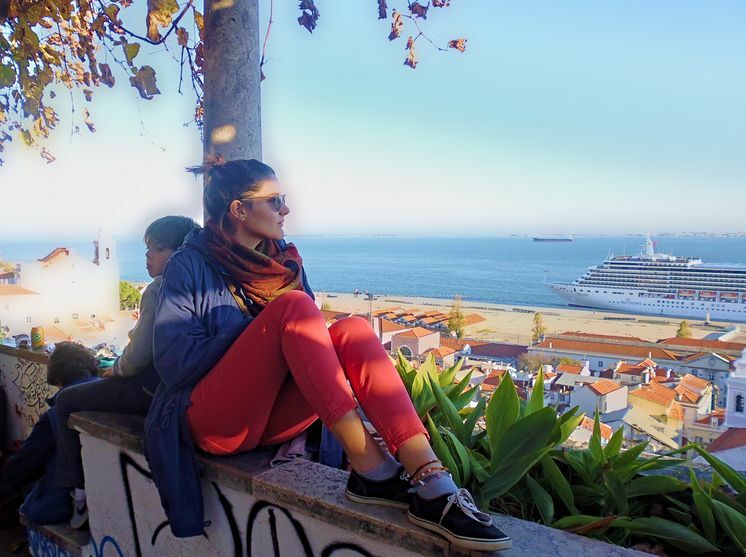 If you go further and climb up the hill behind the balcony, you’ll find one of the hidden sunset spots of Lisbon. Here comes a top secret location which can be barely found in the common lists. We don’t know the name of this viewpoint or if there is a name at all. It’s up a hill, next to Universidade Nova de Lisboa. By walking from the big shopping mall El Corte Inglés by São Sebastião, you’ll see a bridge. Follow the bicycle path starting at the end of the bridge, passing a closed park that belongs to a business school. At the end of this bike path, climb up the stairs. Suddenly you stand high upon a field with a stunning view of a bridge standing on gigantic stone columns. This is the Aguas Livres Aqueduct, a historic remnant of the 18th century. Opposite the viewpoint, the Monsanto park spreads on the hill. When you look at Monsanto park in the distance, you’ll see the skyline of the abandoned Panorâmico restaurant. If planning a trip to Monsanto, Lisbon’s biggest forest park, think about to drop by the abandoned restaurant Panorâmico. You’ll definitely fall in love with this place. 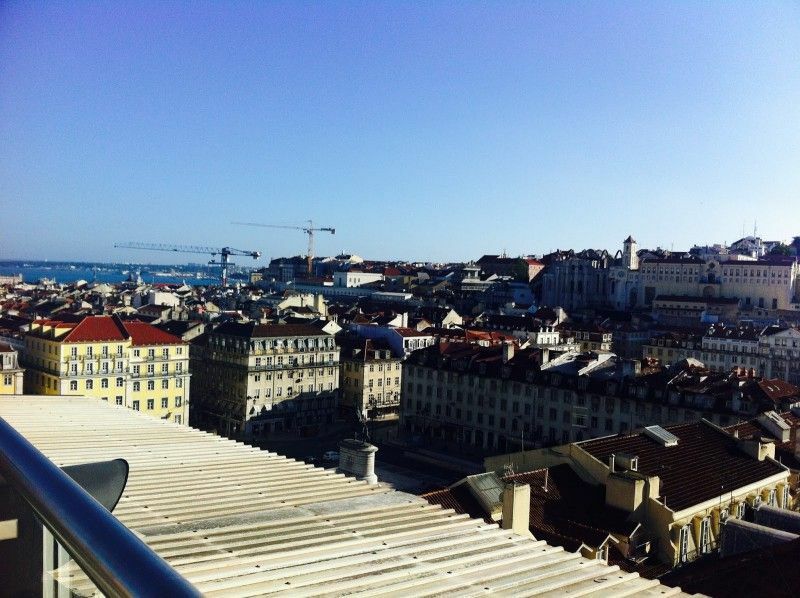 After exploring the remnants of what used to be one of Lisbon’s most expensive restaurants, climb up the roof. Behind the broken windows you can see one of the most beautiful sunsets embracing the whole city.